To convert a CSV file to XML select Tools > Convert CSV to XML... and choose the path or URL of the CSV file to convert. • Encoding -- Specifies the encoding of the CSV file. • Delimiter -- Specifies the character that separates values in the CSV file. • Headers in row -- Specifies the row where the headers are to be found. • Data starts in row -- Specifies which row the data starts on. • Data ends in row -- Specifies which row the data ends on. 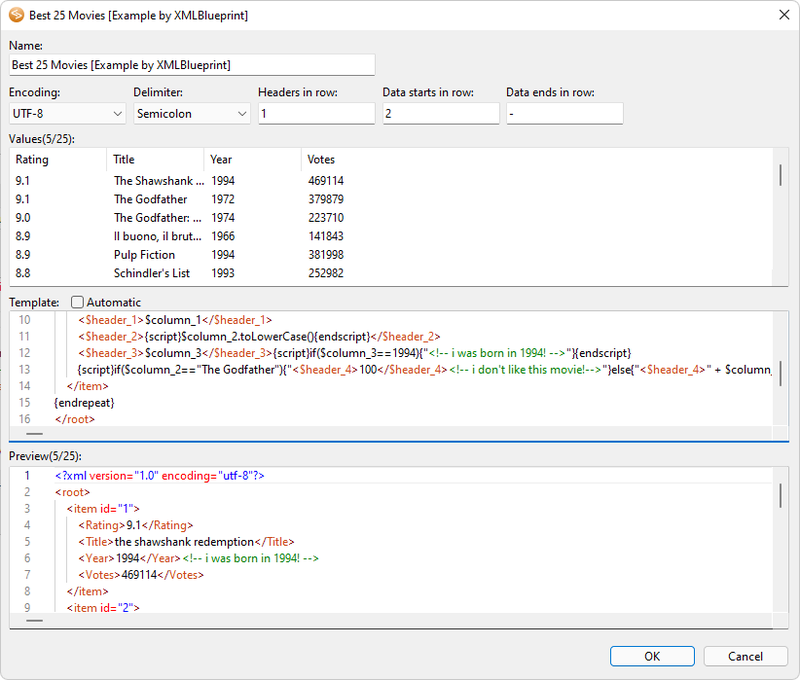 • Values -- The first 5 rows in the CSV file are displayed in tabular form. If the displayed data is not as expected, try again by choosing a different Encoding or Delimiter. • Preview -- An example of what the generated XML will look like.